"Thanks to Bradley Manning, vast troves of information have become public knowledge, making possible more informed debate about war and peace. For instance, he leaked the now-infamous "collateral murder" video,* with a soundtrack of chilling banter as U.S. servicemen in a pair of gunships fired on civilians in Baghdad. Other evidence that Manning brought to light includes a U.S. diplomatic cable ** about a covered-up massacre of at least 10 civilians, including young children, in the Iraqi town of Ishaqi. That revelation stiffened the resolve of Iraq's government to seek jurisdiction over American troops for criminal actions. Washington found the demand unacceptable, thus hastening full U.S. military withdrawal from the country." 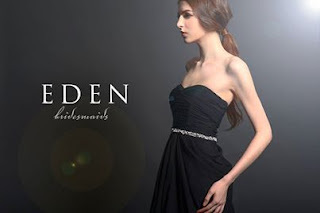 Homecoming 2013...This Awesome NEW Terani Couture...40% Off Retail! Great Selection At GREAT Prices!!! "It was bad enough when a train from the U.S.-owned Montreal, Maine & Atlantic (MM&A) derailed and exploded in Quebec a few weeks ago, killing at least 47 people, leaking millions of gallons of crude oil into the ground and nearby waterways, and decimating the small town of Lac-Mégantic. 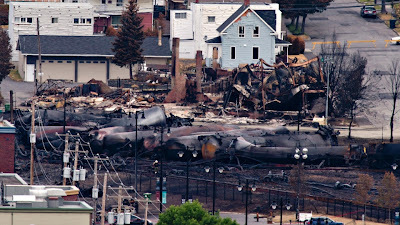 Now, after a gut-wrenching memorial service and a press conference in which the insufferably glib head of MM&A's parent company Rail World belatedly turned up to blame firefighters and an engineer for the disaster without offering a shred of evidence, the company has failed to cover over $4 million in clean-up costs the town and province have been left to pick up. They are now suing. If we ever needed a text-book case of why corporate accountability, or some vestige of it, is needed, this is it. With background on the profits-before-safety record of the company, frightening parallels with tar sands issues, and the cringe-worthy CEO press conference as town residents express their rage. As well they should." It is Wigle Sisters Wednesday!!! Salads - Watermelon & radish summer salad, Sweet wedge salad w/peaches & prosciutto. Entrees - Tandoori chicken w/jasmine rice, mango chili chutney and riatta, Cowboy flank steak w/ quinoa stuffed sweet peppers. Dessert - S'more pie and Skillet cobbler. Connections Cafe and Fair Trade Boutique is located on 109 S Market St Ligonier PA Small group reservations, catering and carry out available, 724 238 9611. If you lust for eating, preparing and serving healthy foods, like to interact with people and work as a team in a fun atmosphere, Connections Cafe and Fair Trade Boutique may be the right match for you. Presently there are part-time opportunities. "Butler County residents gathered Saturday at Alameda Park to advocate for clean energy. Marcellus Outreach Butler, a group dedicated to raising awareness of the dangers of hydraulic fracking for natural gas, hosted the fossil-free energy fair. Patricia DeMarco, a professor at the University of Pittsburgh who has studied the environmental effects of energy, was the keynote speaker. “We're putting forward the argument that we have to stand for the future generations and the other living things on the Earth that cannot speak,” DeMarco said of the purpose of the fair. In addition to other speakers, two representatives from Slippery Rock University were on hand to present how the school uses and teaches sustainable technologies." 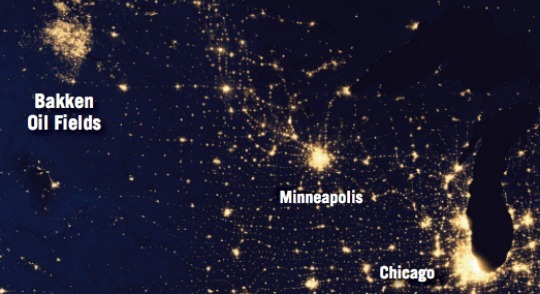 "Bright torches of natural gas are to become an ever-more common sight along the horizon of North Dakota as the environmentally devastating practice of flaring, or burning off natural gas as a byproduct of oil production, continues to skyrocket, according to a report released Monday by sustainability research group Ceres. Analyzing oil and gas production data on the Bakken oil fields, researchers estimate that the volume of flared gas "more than doubled between May 2011 and May 2013," and in 2012 alone, the greenhouse gases emitted from flared wells was equivalent to "adding nearly one million cars to the road." 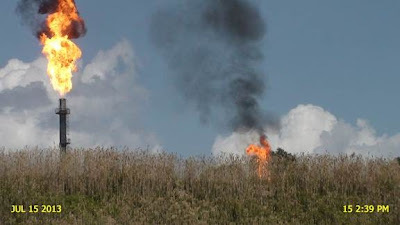 Further, as report authors Ryan Salmon and Andrew Logan note, because the flares only partially combust the natural gas, "a variety of other hazardous pollutants are generated by the process, including black carbon, another potent driver of climate change with adverse health effects." Though the report focuses on the great economic waste—an estimated $3.6m in fuel lost each day, or $100m a month—of this practice, the impact on the environment is undeniable. Further, one cannot help but compare this dramatic squandering of fuel to the untold environmental toll that natural gas extraction processes, particularly fracking, are taking elsewhere in the United States. The latest data shows that the state’s oil and gas developers flared (e.g., threw away, spewed into the atmosphere, lost) 29 percent of the natural gas they produced during May 2013." I feel compelled to write this friendly reminder as I was almost hit while walking across the street... AGAIN! Please follow the traffic rules, keep alert, and be mindful of the bikes and pedestrians that share the streets. Remember that pedestrians have the right of way at crosswalks and intersections without traffic signals (especially in areas with signs posted that say, "Yield to Pedestrians") and when they're walking on sidewalks that extends across an alley, building entrance, road, or driveway used by motorists. If you need to brush up on your walking safety, CLICK HERE to check out this link. Let's not ruin the beautiful day with any vehicular manslaughter on the Diamond. Standing together, singing songs, holding a flag? Risk arrest. 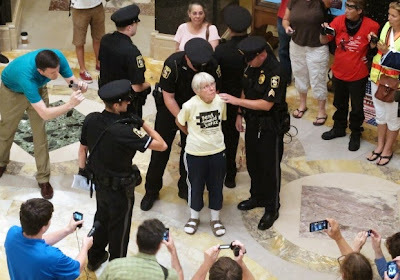 Wisconsin Capitol Police arrest Joan Kemble, 80. Police arrested 22 people for gathering without a permit in their first crackdown on daily protesters since a federal judge ruled groups need a permit to gather in the building. "Because Koch Brothers' stand-in (Wisconsin Governor) Scott Walker is some tired of pesky protesters trying to block his corporate agenda and otherwise exercise their alleged constitutional rights to peacefully assemble and even, God forbid, sing, Wisconsin police are in the third day of a crackdown that saw scores of demonstrators arrested in the state Capitol under newly approved rules requiring permits for gatherings of over 20 people - a slight improvement over an earlier rule for gatherings of four, but not much, given that it's supposed to be the people's house and all. Many of those arrested and given $200 tickets were Solidarity Singers in their 70s and 80s who have been turning up for two years to protest Governor Walker's policies. Intriguingly, the arrests that started Wednesday seem to have merely galvanized protesters, more of whom came each day. Incredible video of cops sweeping in to randomly arrest white-haired miscreants, singing moms and kids, and a former Marine and Veteran for Peace whose flag, in a moment of awful and sublime symbolism, the police stomp on in their haste to handcuff him and haul him away." "PITTSBURGH -- The boom in oil and gas fracking has led to jobs, billions in royalties and profits, and even some environmental gains. But some experts say arrogance, a lack of transparency and poor communication on the part of the drilling industry have helped fuel public anger over the process of hydraulic fracturing, or fracking. "It's a big issue for the industry. I have called for greater transparency. 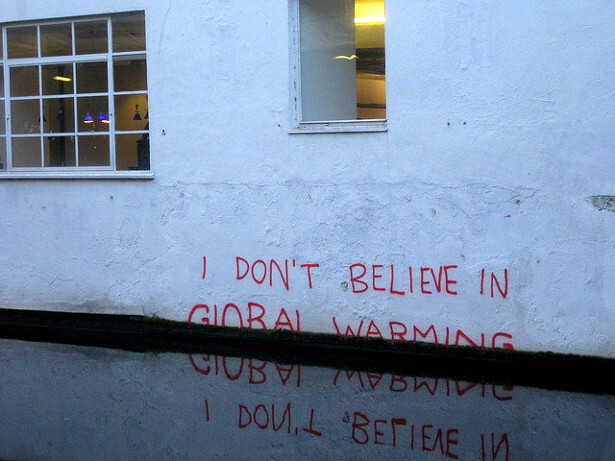 That is the only way to have an honest conversation with the public," said John Hofmeister, a former Shell Oil Co. president and author of "Why We Hate Oil Companies." As an example, Hofmeister said, some industry leaders have suggested that the fracking boom has never caused water pollution. 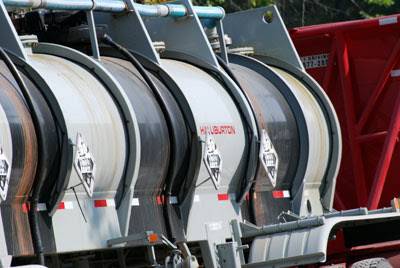 But while the vast majority of wells don't cause problems, "everybody knows that some wells go bad," Hofmeister said. Over the last five years, advances in technology have led to a surge of drilling in states such as Pennsylvania, Colorado, Arkansas and North Dakota. Previously inaccessible deposits of shale oil and gas have been unlocked by fracking, a process in which large amounts of water and sand along with chemicals are injected deep underground to break apart the rock." It's time.... to try out our fabulous salads, fritattas and exquisite desserts while you browse in the Fair Trade Boutique. Fritatta - Basil, tomato, summer squash with a taste of Asiago. Sandwich - Grilled veggies and cheddar on housemade bread. Connections cafe and Fair Trade Boutique is located on 109 S Market Street Ligonier PA Carry out, small group reservations and catering service available by calling 724 238 9611. Happy Monday! This narrative has perpetuated the lie that Zimmerman’s history of calls to the police indicates obsessive racial paranoia. Thus, discussing the verdict on the PBS NewsHour, University of Connecticut professor and New Yorker contributor Jelani Cobb asserted that “Zimmerman had called the police 46 times in previous six years, only for African-Americans, only for African-American men.” Actually, prior to the call about Martin, only four of Zimmerman’s calls had to do with African-American men or teenage boys (and two of them were about individuals who Zimmerman thought matched the specific description of burglary suspects). Five involved complaints about whites, and one about two Hispanics and a white male; others were about such issues as a fire alarm going off, a reckless driver of unknown race, or an aggressive dog. Township looking for a new zoning officer. Accepting letters of interest until August 2nd. Komar told Thomas that the township would look into pursuing theft charges against Angelo and Whipkey. Whipkey cited personal reasons when he resigned in the midst of his re-election campaign, township officials said. The supervisors had not previously disclosed the circumstances surrounding his resignation. On Thursday, Komar and Supervisor Albert Shadron voted to fire Angelo. Grover Binkey voted no and said officials should wait until an audit is completed. The zoning office will be closed until further notice, and letters of interest for the zoning officer position will be accepted through Aug. 2. There are two movements afoot with the potential to unite people over the political spectrum. They are LIBERTARIANISM and MODERN NUCLEAR POWER. Open your mind and IMAGINE. the queen nest for the Mother State...you want it? you got it. Davis lets out that inside there will be supercomputers, or what NSA labels “high performance computers.” These need “different cooling and different power distributions as opposed to something you bought from Best Buy,” he says. The machines, along with whatever other technology is tucked in the facility, are slated to power on by Oct. 1. Four years ago, the stated purpose of the megaplex near Salt Lake City was to amass foreign intelligence and warnings about hackers. Officials described it as an extension of President George W. Bush’s 2008 Comprehensive National Cybersecurity Initiative, a largely classified, cross-agency program to protect U.S. computer networks against adversaries. Today, it is evident the data plantation will not be linked to any one program. Instead, the systems inside will warehouse counterterrorism information collected in aggregate, including millions of Americans’ phone logs for five years and certain foreigners’ online messages, NSA officials confirm. Spies at other locations will decipher what’s accumulated to thwart terrorist attacks, cyber assaults, and weapons of mass destruction. It's all set. We Read the Constitution on September 14th at 2:30pm in the Pennsylvania Room of the Ligonier Valley Library. The pocket size booklets have been ordered, the room is reserved. BYOB and one for me! It's going to be a scrumptious evening Aug. 9, as the Ligonier Valley Education Trust and the Ligonier Valley YMCA conduct the 2013 Ligonier Valley Pie Contest at Town Hall. Slices and whole pies will then be sold at The Stroll, which takes place the same day. Winning delectables will be auctioned off starting at 6:30 p.m. There is no entry fee and pre-registration is encouraged, which runs through Aug. 8. Entry forms can be found at the library, Town Hall and the YMCA. Ligonier Valley Trail & Bikeway committee members and volunteers will soon begin developing the next section of the north end of the trail, thanks to additional funding from the Allegheny Foundation and the Larson Family Charitable Gift Fund. The foundation provided $25,000, and $3,000 in grants monies was received from the Larson fund to be used for developing the trail north of Peoples Road. The planning commission agreed to address the YMCA's request as a conditional use for a medical office, and Jim McDonnell said it should also consult with the borough council to confirm it views it the same way before a decision is made in the matter. A medical office, according to the zoning ordinance conditional use, can be permitted so long as it meets several requirements, specifically parking for patients and employees is off-street and the parking and delivery zone plan does not conflict with existing borough traffic flow. The planning commission also devised a list of question categories to submit to both the Ligonier Valley YMCA and the borough council for the public hearing. Their concerns include the size of the added building, the setbacks of the expansion, security, number of employees and parking for employees. Looking for an investment property? Here's a nice duplex for sale in Derry. In Derry Borough, Pa Just 2 blocks from the Derry Pool and ball field. The investigation into former supervisor Keith Whipkey's office activity led to the uncovering of proof of Angelo's activity, according to Komar, who would not give further details regarding the proof. By now the world knows about the revolt within the Republican Party over civil liberties and foreign policy, as Kentucky Sen. Rand Paul and others condemn PATRIOT Act–style encroachments on citizens' rights, Iraq-style projections of power abroad, and a drone war that threatens to blur the difference. Lately there's been talk of another rebellion, this one directed at the economic policies that have come to define much of the Republican Party, and for that matter much of the Democratic Party as well. The members of this movement, to the extent that a nascent tendency can be described as a movement, have been labeled libertarian populists—"libertarian" because they aim their fire at big government, "populists" because they aim their fire at other large, centralized institutions too. The LibPop idea is to take an axe to the thicket of corporate subsidies, favors, and bailouts, clearing our way to an economy where businesses that can't make money serving customers don't have the option of wringing profits from the taxpayers instead. "The problem with both of these views is that the political discourse of our nation has shifted so far toward a fatalistic acceptance of the status quo - the increasing wealth gap between rich and poor, the seemingly interminable march of privatization and the unassailable logic that the market will solve every problem ("if you'd just make better choices, you could overcome any structural impediment!") we don't even consider any major policy interventions to be a valid part of the discussion. We also don't even consider how the labor practices of fast food companies, where there were massive protests for much of the past spring against poverty-level wages and where fast food workers even in the nation's Smithsonian museums recently have protested their poor wages, lead to the very living standards that make it difficult for working people to buy and prepare healthy foods. It is a depressing day, however, when the best we can come up with as a solution to the crippling obesity epidemic in the US is to hand over the car keys to McDonald's and hope that their interests in short-term profits will happen to coincide with healthier food choices. As a historian, I'm not in the habit of engaging in counterfactuals, but if we had taken this tack with the tobacco companies, my guess is that we'd all still be inhaling second-hand smoke at every bar, restaurant and airplane in the country while hearing how much safer "light" cigarettes are." Read the discussion at http://www.truth-out.org/opinion/item/17725-fast-food-and-neoliberalism-a-response-to-david-freedmans-call-to-get-out-of-mcdonalds-way. Animal welfare groups, individuals start legal fight against 'unconstitutional' Utah law that gags reporters and whistleblowers from documenting abuse. "A group of animal rights groups and advocates filed a landmark lawsuit on Monday challenging Utah's "ag-gag" law as an unconstitutional attack on free speech and freedom of the press that criminalizes whistleblowers while shielding corporate agriculture. The state's 2012 law criminalizes a person that records sounds or images from a livestock operation or applies for a job at a livestock operation with the intent to make such recordings; in other words, it prohibits documenting animal abuse. 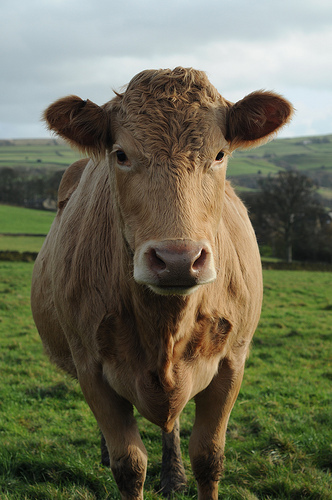 corporate agriculture sees [the recording of animal abuse] as a threat to profits. Rather than change to less abusive practices it has instead chosen to keep the public uninformed by aggressively pushing for legislation that makes such investigations illegal– a classic case of shooting the messenger. The laws are designed to thwart the collection of evidence of wrongdoing, thereby “gagging” reporters and whistleblowers from exposing the facts. It’s an incredible abuse of power and public trust. Meyer was the first person in the nation charged under ag-gag laws after she filmed a slaughterhouse from a public road. Charges were soon dropped, but the law stands in Utah and other states as well. " At least I can't find any rules governing outdoor displays by retailers. Why is Ligonier Township giving the Curiosity Shop in Laughlintown grief? Graham's Antique Mall and the Fleatique have items displayed outside and they aren't being cited. There used to be a store across from the Colonial Inn that displayed all kinds of items outside including carriages and I don't recall hearing that they were cited. Twisted Vine has all kinds of stuff displayed outside their store and I don't think they have been cited. Ligonier Township says the Curiosity Shop must comply with industrial or commercial storage standards. WAH? Come on, get real. This is a retail display and the township has NO rules concerning outdoor display by a retailer. No rules means no rules. If they had rules, we'd all expect them to be fairly implemented anyway. Right??? Anyone have any nice vintage pictures of Rolling Rock Race tailgating that they are willing to share? 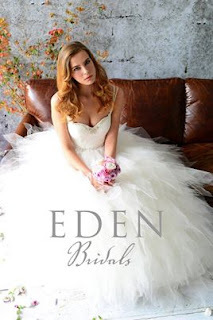 Wrote one tipster, “Nikki Schwab’s are awesome. Her ‘do is simply perfect for her face frame and she pulls them off beautifully! Not everyone can like she does. Had a lovely Mellow Mike last night and time to announce MM is going on hiatus. We were unplugged last night and enjoyed the reading of several Joe Steirheim poems and even had a little guitar lesson from Bob Seitz. It was a nice way to wind things down. Taking a hiatus from regular Mellow Mike so last night was the last Monday at Connections for now. Now is the time to stand up and join your fellow individuals in the IndieBound mission supporting local businesses and celebrating independents. IndieBound supports Independent Business Alliances around the country. To find an alliance near you, visit AMIBA or BALLE. Getting Mellow tonight at Connections Cafe even if we get wet doing it! Mellow Mike tonight Connections Cafe 6:30 to 9:30. OPEN STAGE FOR MUSIC AND READING. Elise & Reda will be cooking up a different menu every Wednesday evening starting July 31. Seems you can never escape the presence of the oil and gas industry for very long. Returning from a weekend trip to the Laurel Highlands, we became part of the ‘captive audience’ in an Interstate 70 traffic jam due to a spill of [hydrochloric acid & ‘who knows what’] when the interstate was closed for over 4 hours yesterday from a truck like the one in the photo below. Thanks Halliburton! Once again, John Poister of the Pa DEP sounds more like a PR guy for industry than a representative of the commonwealth’s environment. And the iffy-ness of what was actually in this tanker truck further points to improvements that need to me made with placarding and shipment logs of O&G trucks travelling Pennsylvania highways. Tonight 6:00 to 9:30 p.m.
Fritatta - Yellow squash, tomato, spinach and asiago. Sandwich - Grilled smoked gouda with sauteed mushrooms. Salads - Cauliflower & pea, Curry Chicken, Greek orzo, Quinoa Tabbouleh, Summer corn, Tuna & red bean, Zucchini pesto. A variety of delectable desserts. Employment opportunity available, part-time weekends, inquiries at the cafe. Cary out, small party reservations and catering service available, 724 238 9611. I was chatting recently with my husband about the term "sample bias" and loved his clear description of one: "It's when someone says, for example, "We studied 8 brand-new cars for a year, and found no rust on any of them... ." Doesn't mean they won't rust, does it? The study, done by the National Energy Technology Laboratory in Pittsburgh, marked the first time that a drilling company let government scientists inject special tracers into the fracking fluid and then continue regular monitoring to see whether it spread toward drinking water sources. The research is being done at a drilling site in Greene County, which is southwest of Pittsburgh and adjacent to West Virginia. Industry insiders are now coming clean: Louis W. Allstadt was executive vice president of Mobil Oil; he ran the company's exploration and production operations in the western hemisphere before he retired in 2000. "Allstadt: So when you talked about "the race for what's left," (fossil fuels) that's what's going on. Both the horizontal drilling and fracturing have been around for a long time. The industry will tell you this over and over again - they've been around for 60 years, things like that. That is correct. What's different is the volume of fracking fluids and the volume of flow-back that occurs in these wells. It is 50 to 100 times more than what was used in the conventional wells. The other [difference] is that the rock above the target zone is not necessarily impervious the way it was in the conventional wells. And to me that last point is at least as big as the volume. The industry will tell you that the mile or two between the zone that's being fracked is not going to let anything come up. In the early days I was not sure that a ban was the right thing to do. I was thinking that there probably could be a technical solution, and if you had regulations [written] properly, you might be able to do it. The industry had solved some huge technical problems over the years. Like, how do you drill 250 miles offshore in iceberg alley off Newfoundland? The industry actually has a lot of very smart people working for it. As long as the box that they're working in is manageable, they can do a very good job. I think that what you've got in fracking is 'How do we work in a box this big,' narrowly defining the problem, [he holds his hands a foot apart in front of him] when you're really working in a huge box [he stretches his arms out wide] The real box is as big as the globe and the atmosphere. And they're not seeing the consequences of moving outside the small box that they're working in." Read the full interview at http://www.truth-out.org/news/item/17605-former-mobil-vp-warns-of-fracking-and-climate-change. DeSmogBlog partnered with Pulitzer Prize-winning cartoonist Mark Fiore to produce this spoof video in the vein of Francis Ford Coppola's "Apocalypse Now." Making its debut today in honor of Gasland 2, which features the details of the gas industry's psychological warfare scandal. Mexican Menu - starts at 5 p.m. Carry out, reservations, catering service available by calling 724 238 9611. What kind of camera caught all of this and was it a private security camera? Video footage recorded a grey or silver car dragging the safe around 4:20 a.m. The safe became dislodged when a chain broke. The footage showed the safe later being loaded into a white GM van, which drove west on Darlington Road. The van had a light blue ladder on a ladder rack on the driver's side. 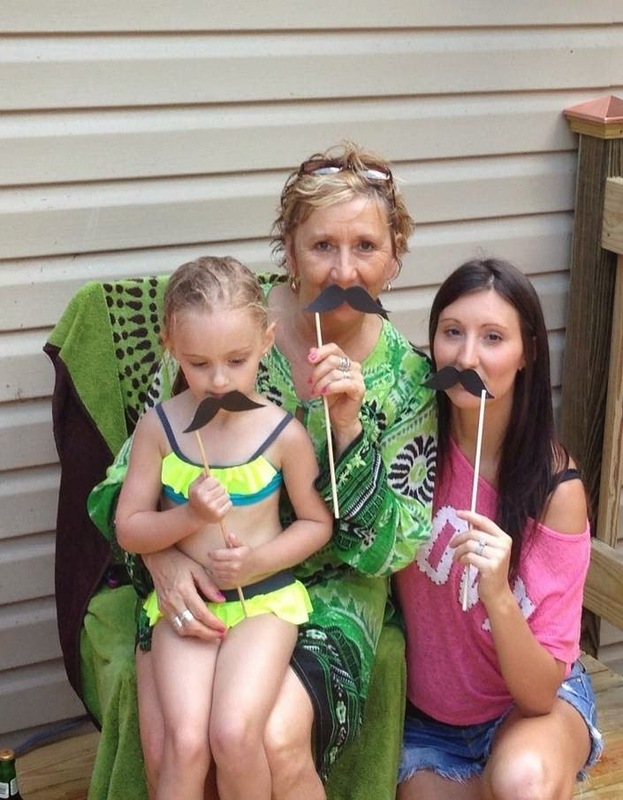 Anyone with information that could aid in the investigation is asked to call Ligonier Township Police Department at 724-238-5105. McGregor charged with stealing $120,000 from an escrow account. When a Greensburg teenager's mother died in a vehicle accident in January 2012, she left a $300,000 insurance policy for her son. Two local attorneys were appointed by the court afterward — one to act as a guardian and the other as a trustee for the funds from the policy. When the son, who is now 18, made several unsuccessful attempts to reach J. Russell McGregor, 52, in February to obtain money from the trust account, he reported the situation to Westmoreland County Detective Thomas Horan. That led authorities to discover that McGregor, a former Ligonier attorney, allegedly took nearly $120,000 from the account, according to an affidavit of probable cause. Which is to say you acted from love, (Edward), from all the things the new surveillance state imperils: privacy, democracy, accountability, decency, honor. The rest of us, what would we do for love? What is terrifying to the politicians at the top is that you may be our truest patriot at the moment. Which makes all of them, with their marble buildings and illustrious titles, their security details and all the pomp, the flags, the saluting soldiers, so many traitors. The government is the enemy of the people; the state is the enemy of the country. I love that country, too. I fear that state and this new information age as they spread and twine like a poison vine around everything and everyone. You held up a mirror and fools hate the mirror for it; they shoot the messenger, but the message has been delivered." 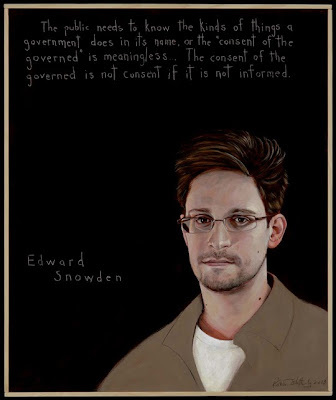 "(Portrait artist) Shetterly chose Edward Snowden as part of his growing series focused on 'whistleblowers'—which includes, among others—Daniel Ellsberg, who famously leaked the Pentagon Papers during the Vietnam War; Pfc. 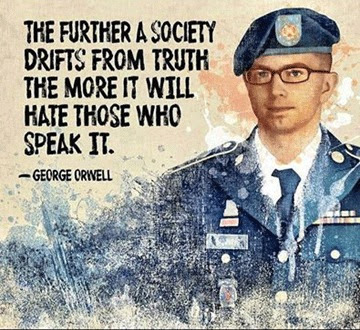 Bradley Manning, currently on trial for his leaks of material related to US foreign policy and the execution of the Iraq and Afghanistan wars; and former CIA officer John Kiriakou, who is serving a prison sentence for public discussion of the agency's torture program. Daniel Ellsberg told Common Dreams today that he welcomes Snowden to the club of US whistleblowers painted by Shetterly. He said Snowden's case exemplifies the courage of those who use their unique position of access to act on behalf of the greater society. He did so, explains Ellsberg, knowing full well the costs to his individual liberty would be great, but acted anyway. "I see Edward Snowden as someone who has chosen, at best, exile from the country he loves—with a serious risk of his assassination by agents of his government or life in prison (in solitary confinement)—to awaken us to the danger of our loss of democracy to a total-surveillance state," Ellsberg said." Not your average heirloom tomato there on the left...this one is from a garden downwind of the devastated Fukushima nuclear plant. Safe energy producing conditions for healthy living. "A "steam-like gas" has been seen rising from the No. 3 reactor building at Japan's devastated Fukushima nuclear plant, where contaminated waste water remains. Tokyo Electric Power Company (Tepco) says there is as yet no "emergency situation" and they will "continue to monitor the status closely." This is the latest in a string of problems including water leaks, power failures and last week's report of a sharp increase in radioactive cesium in groundwater. 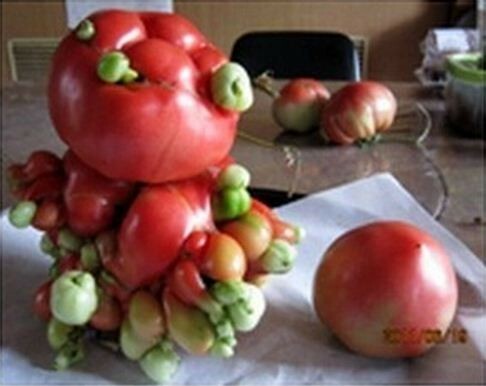 Now pictures have surfaced of grotesquely deformed fruits, vegetables and flowers near the plant. Some argue there's no definitive proof they're the result of radioactive contamination because haven't you ever heard of coincidence? We report, you decide." You bring the wine....We'll make the pizza. Enjoy eating gourmet grilled pizza on the porch or in the comfort of air-conditioning starting at 5 p.m. Tonight's pizza selections: Caramelized onion & bleu cheese, Mushroom & spinach, Hot sausage. Connections Cafe and Fair Trade Boutique is located on 109 S Market Street Ligonier PA Small party reservations, catering and carry out available by calling 724 238 9611. ZeroFossil is a growing alternative energy provider. Representatives will demonstrate how solar, wind, water and human power can have a positive impact. With a main focus on battery backup, the company designs, manufactures and assembles battery-powered generators in its Munhall shop. They will demonstrate dueling Bikerators — two of human-powered units mated to water sprayers. The units a distance apart and riders pedal to soak each other. They will have a solar-powered water fountain which will double as a produce rinsing station. The KurbMaster, a waste vegetable oil-powered Mercedes bread truck with a healthy solar array on top, will be on display. To demonstrate the new method, Zhang’s team wrote a 300 kB digital text file into fused quartz glass using a femtosecond laser that produced extremely short and intense pulses of light at a 200 kHz repetition rate. The pulses were sent through a spatial light modulator (SLM), which split the light into 256 separate beams to create a holographic image. A specially designed laser-imprinted half-wave plate matrix was built to control the polarization of the light without the need for moving parts. The laser-imprinted dots were arranged in three planes separated by a distance of five microns, on a sliver of fused quartz, and dubbed “Superman memory crystals” after the once-fanciful technology featured in the Superman films. 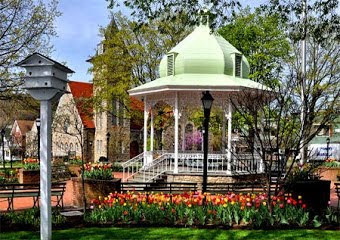 Connections Cafe and Boutique is located on 109 S Market Street Ligonier PA Eat in dining, on the porch or take it with you. A BYOB Establishment. John L. Obenour, 84, whose Hornhead Farm sits next to the plant, said he went to the plant Monday to complain after repeated episodes of billowing black smoke found their way to his property. He said he has black soot on his window seals and black streaks on his roof. Such episodes have happened several times, he said. 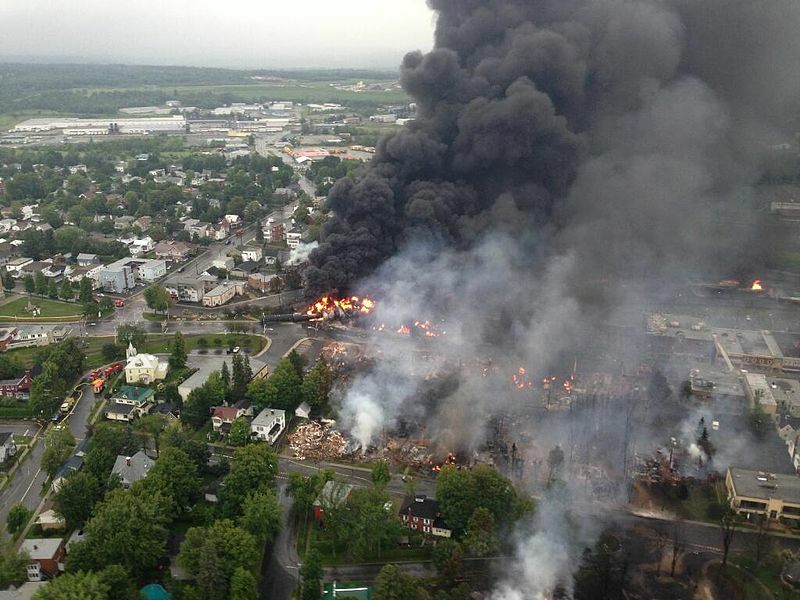 "I could detect a smell because the atmosphere was so heavy, as it is," he said. "The last couple of days I could detect that smell and the god-dang black stuff in the air was settling this way and that. "You can't stop progress, and I never want to be a thorn in their side," he said. "But I also want to have clean air." Raina Rippel, director of the Environmental Health Project based in Peters, said, "We have had concern for some time about residents' health and safety living in close proximity to this site, and this event magnifies those concerns."" Are we ready for this in the Ligonier Valley, people? Who wants it in their backyard? (Or are folks counting on the "lower hanging fruit" -- those poorer parts of PA with weak local governments -- being sacrificed to the fracking industry? Are people holding their breath - pun intended - that it won't happen "too much" here?) Again: In your back yard...in your neighbor's field just a lungful of air away? In 2009, under pressure from Allegheny Defense and other environmental groups, the Forest Service sought to monitor the drilling, implement environmental safeguards and provide a measure of planning to the spaghetti network of drill sites. 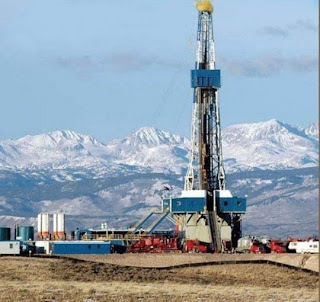 But 93 percent of the mineral rights in the state are privately held and the Forest Service, in a case currently under review by the 3rd Circuit Court of Appeals, was sued by the gas companies who claim their property rights were violated."